B. 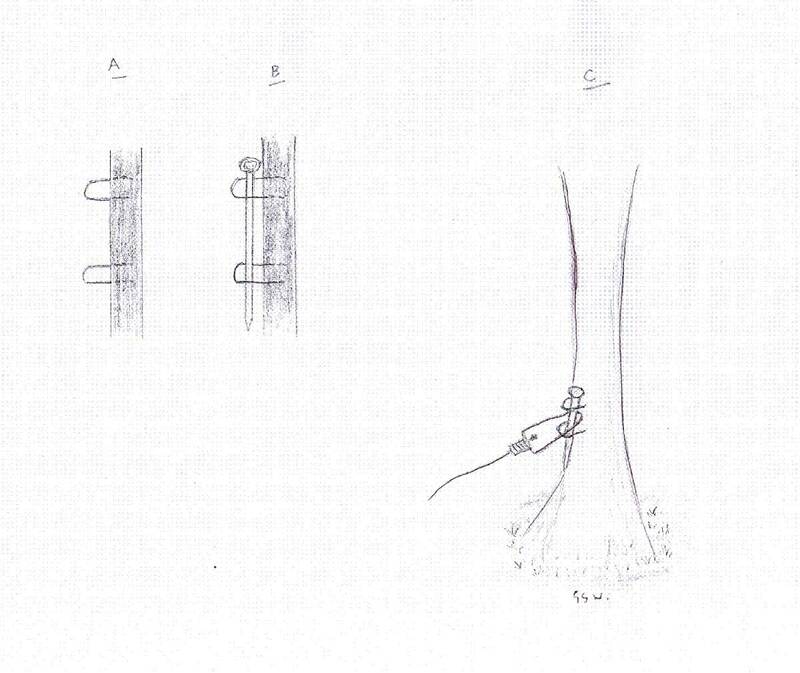 Wire has been bent into even U shape showing the plan elevation of wire sitting along outside of U bolt legs. 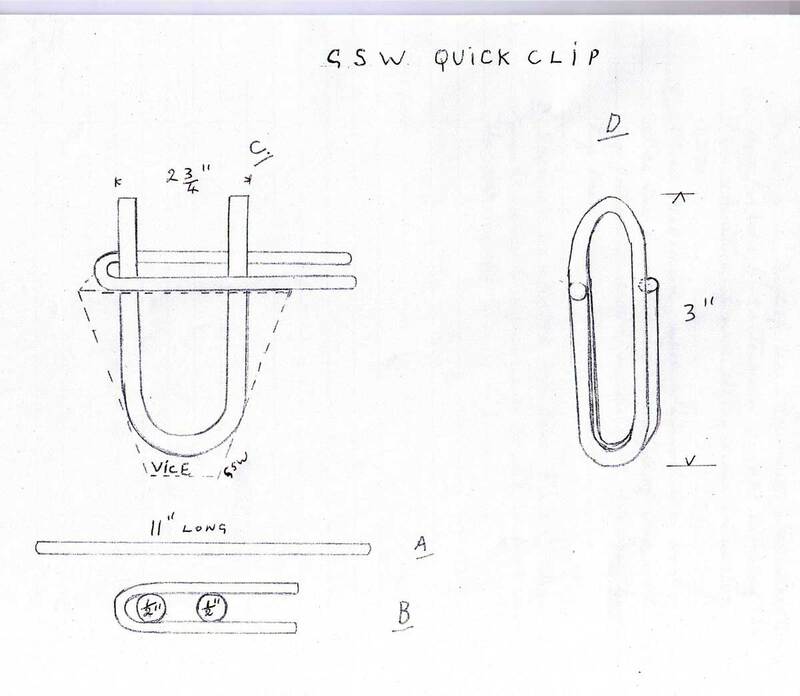 C. U bolt held in vice, wire which has been bent into U shape has been placed flat on top of vice with U bolt legs protruding upwards inside wire you now bend wire legs abck around U bolt on itself. D. Showing completed oval ring 3″ long takes only seconds to attach to a fenceline or to attach a snare swivel to the oval ring clip. A. Showing a tree with two 2″ staples one above the other 1 1/2″ apart. B. Showing a 4″ steel nail inserted through the staples from the top. C. Showing how to attach a snare swivel to a tree, extract nail and slip the swivel in between staples then drop the nail through to secure snare to the tree simple and highly effective a two second job! A. 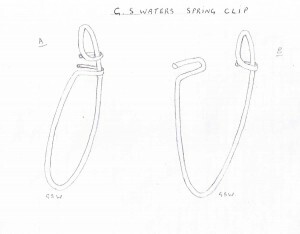 This simple spring clip is approx 6″ long and made from 3mm high tensile english wire, its very strong and has good tension its simple to make and only costs pennies and is a very quick method to secure snares and traps. Squeeze to open and close. It can be stapled to a tree or used with 10mm or 1/2″ steel stakes with a nut & washer welded to the top and left protruding from the ground about 1″ to allow spring to rotate, they are galvanised and will last forever, they can be fitted onto cable earth anchors also. B. 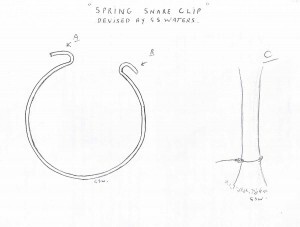 Showing spring clip in open position it is a two second attachment. 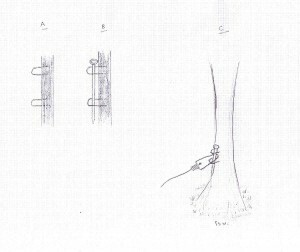 A.This illustration shows a simple circular clip made of high tensile 3mm english wire it can be made to fit into your hand or to fit larger diameter trees at point (A) the wire is just bent straight back onto itself at point (B) the wire is bent back on itself from the side therefore the hook lies flat and engages into hook (A) by simply squeezing the loop between your hands, just slip snare swivel onto clip then slip around tree and engage the hooks, the strain is taken around the shoulder of the clip as the pulling power is spread out due to tree diameter. 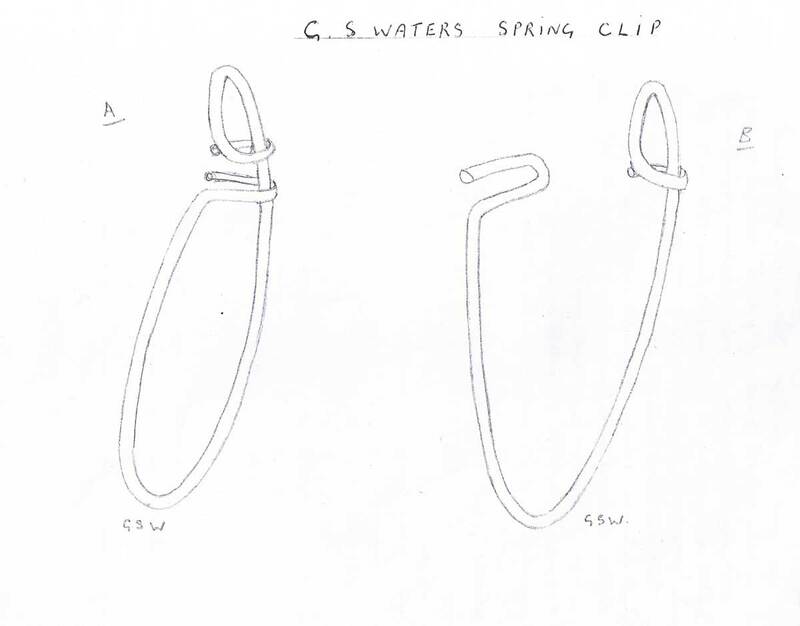 C. Showing simple clip around tree with snare swivel attached. 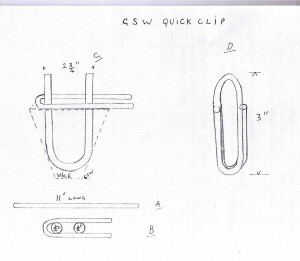 You cannot get any simpler or quicker method that costs pennies to make and they don’t rust, no extension wires needed. All the gamekeepers who have seen it say its so simple and effective and hundreds can be made for practically nothing. 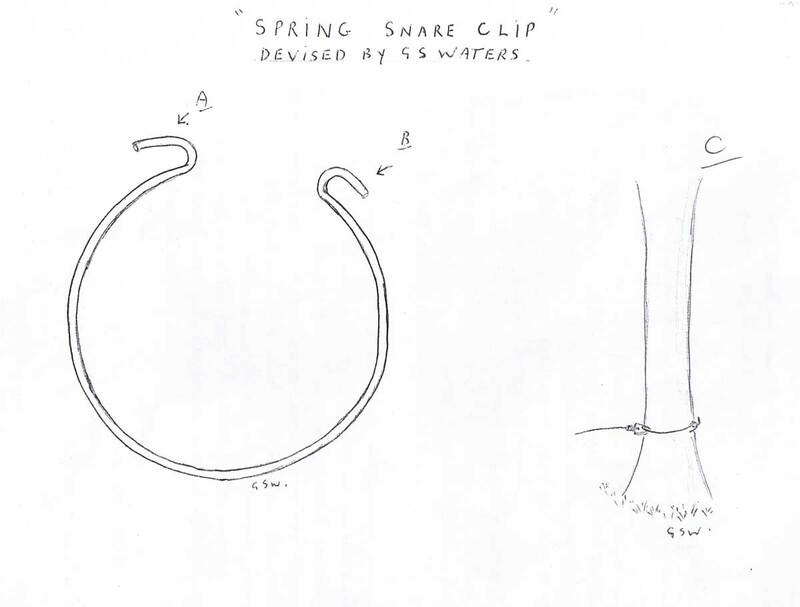 With all these simple devices I have devised over the years,I have made for snaring as simple as it can get. Remember smart thinking saves a lot of hard work.